$90 to buy in (view link below)- you DO NOT have to pay right now to sign up! Three brand new works for concert band, one from each composer. -Skype sessions (or an other video chat program) with the composers for your group(s), if desired. -Being an awesome human being! We believe that every young performer in music ensembles should have the opportunity to be a part of the creation and performance of new music! Our buy-in price reflects this opportunity; although cheap in comparison to a typical consortium, we stress the idea of community and togetherness when it comes to programming and supporting new music, especially for music programs that often do not have the opportunity to participate in such endeavors. Check or card is accepted. A link to buy in to the consortium can be found below. Score and parts will be delivered via email in a PDF format (ZIP) by no later than September 1st, 2018, the date which the consortium will close. Payments should be mailed or paid online by December 1st 2018. Contact Caleb directly at calebhammercomposer@gmail.com if you need to break up the payments in separate installments (2-3 payments) between now and December 1st. If you want to join but do not want to pay now (or want a "payment plan"), fill out the form below! Throughout the nights, months leading up to the creation of this work, my editing for commissions started going later and later in the early hours into the morning as I tried to finish up projects. One day I found myself up at 2 am on a weekday with the energy that most people have at noon on a normal day. Apparently, this was the new time for me to get work done and I felt truly alive and active when everyone else was sleeping. During this time I decided to write a new work about this time in my life. The work follows three main sections: the first section is related to the night coming about and my energy still being full. the second section is about the world around me at night. At this time, nearly everyone else is asleep and everything feels truly silent, even as I lived on a busy street. The third and final section is about my mind coming out of that quiet place and living my life. I’d notice the quiet world around me, and then I’d make it loud and active in my own ways. This section is very similar to the first as it follows the same mindset of being alive in my world during the early hours of the day while everyone was at rest in their beds. Since then, my sleep schedule has thankfully reversed. But, it is fun to look back at being a night owl- that’s when I decided to write a piece about it. Represented by a solo clarinetist, Ophelia is depicted as singing a solitary, peaceful song in the opening of the work. After this introduction, an agitated melody takes over, representative of the conflict between the characters of the play. Ophelia’s song reappears- but every time it is more and more twisted. A brief respite suggests relief from the conflict, but the song is unable to begin again. It bends to the will of the conflict, the voices of the surrounding characters overpower her, and as Ophelia descends into madness, her song becomes a hysterical celebration. The final bars are a wild chromatic descent into the last note of the work- a reflection on Ophelia’s final moments, falling from her tree branch into the brook in which she drowns. The Great River Rapid Chase - a fun, groovy, exciting, and adventurous journey for the concert band. Think of fish swimming upstream in fierce river currents - sometimes with them, sometimes against them. What sort of dangers - and predators - do they face? JOSH TRENTADUE (b. 1994) is a Michigan-born composer and a strong advocate of new music. He is inspired by an eclectic range of genres including rock-and-roll, jazz, film scores, and classical music. He holds a Bachelor's Degree in Music Composition from Michigan State University and has studied with David Biedenbender, Jere Hutcheson, and Zhou Tian. He is currently pursuing his Master's Degree in Film Scoring and Multimedia Composition at New York University and has studied with Ira Newborn and Irwin Fisch. Trentadue's music has been premiered and performed across the midwest regions of the United States, including the 2017 PASIC convention in Indianapolis and the 2015 North American Saxophone Alliance convention in Illinois. In addition, he has also composed for electronic and visual media, beginning with his debut album Neon Revolution. Trentadue was a selected winner of both the 2015 and 2017 MSU Large Ensemble Composition Competitions and was given the opportunity to write several new works for the college's Campus Band and Concert Orchestra. Trentadue is a member of ASCAP, the American Composers Forum, and the Percussive Arts Society. In addition, he is also a founding member of the Millennium Composers Initiative. In his spare time, he is an avid film/television admirer and enjoys the occasional video game. Harrison J. Collins (b. 1999) began composing at the young age of 14. Since then, he has had very little formal composition training, and is largely self-taught. His work for wind ensemble is published by Grand Mesa Music Publishers and C. Alan Publications. 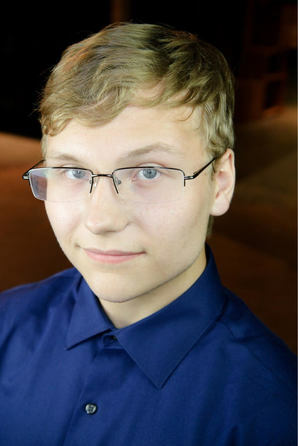 He is a winner of the Sam Houston State University’s Carson Thomas Miller Texas Emerging Composers Composition Competition, the National Young Composers Competition, and multiple Fifteen Minutes of Fame competitions held by Vox Novus, including one in which his minute-long piece Urgency! was selected for performance by the acclaimed West Point Band. Harrison lives in Little Elm, Texas where he frequently conducts and plays bassoon. When not doing these things, Harrison can be found writing, studying, or listening to music.